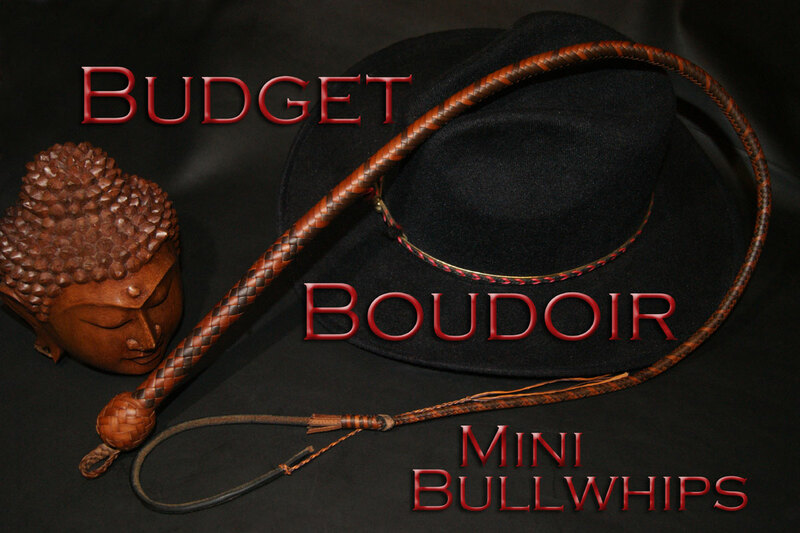 And of course, Budget Boudoir mini bullwhips! Like their BB sisters the mini pocket snake whips, these mini bullwhips are 3ft long at 12 plait, but naturally they have a steel core for the handle, at 5.25″ long. I ONLY make these on spec as I have time away from my custom order queue, but feel free to send me an email to let me know you’re interested! Otherwise, I’ll post any available BB mini bullwhip inventory in the upper right side bar (as well as on various social media sites). Done for a friend, this one has a little bit special pattern: mirrored pink hearts! Built slim line, which creates a better plate out, since it accounts for the 5.25″ handle taking up part of the thong. These whips are shot loaded, and I usually kit them out with a 24″ tapered latigo fall, which you can trim shorter if you like. OR, should you put in a request for the next round of BB mini bullwhips, and would like a shorter fall, send me an email and mention it. These mini bullwhips are HUGE FUN out of the box! You will not be disappointed! They’re excellent as starter whips, as an adjunct to your (hopefully) growing toy bag full of all manner of whip sizes and styles, and they’re also good for smaller venues for throwing (just bear in mind that they DO have up to a 24″ fall). Best of all, they won’t beat the crap out of your wallet quite as much–Budget Boudoir mini bullwhips are $210 smackers! Needless to say, I craft my lovely BB whips with the same care and pride that I put into ALL my builds. Below are more examples of BB mini bullwhips I’ve built in the past. If you’d like one, send me an email and I’ll jot you down on the request list for the next round. OR, keep an eye on the upper right corner of my web page: When I have spec whips available, I’ll post them there at the top. 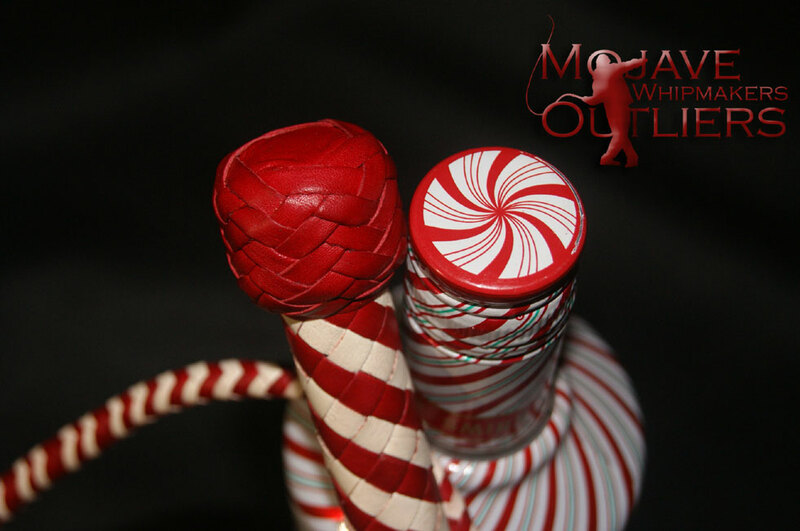 And just to give you an idea what’s possible, a whimsical confection in red and white kangaroo leather: The Candy Cane whip! This one has an upcharge to it, mind you, because the white leather is falconry grade kangaroo hide. Candy Cane BB mini bullwhip heel knot detail! 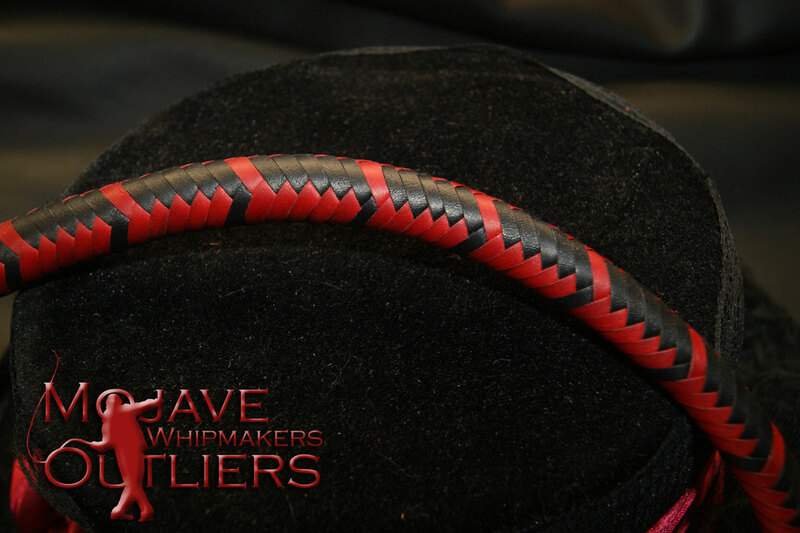 …aaaaand a detail of the fall knots and plaiting on the Candy Cane BB mini bullwhip! This entry was posted in Bullwhips. Bookmark the permalink. ← (SOLD!) Kawanga Stick Delrin Cane!